Sometimes I ask myself questions if the devil possess the power to create human, because looking at the behaviour of some people especially in the HELL called Nigeria, you will definitely understand that they are embodiment of the devil, judging from the way they think, talk and behave is totally different to that of sensible and conscientious human being. 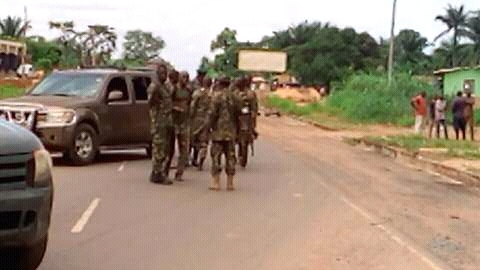 However, I do wonder the reputation Nigeria Military have before the international communities after proscribing IPOB and tagging over 70 million population of an indigenous and unarmed peaceful people terrorists. Nigeria Military should as a matter of urgency prove to the world with facts and figures how IPOB is a threat to the peace of the general public or the activities of IPOB that's associated to that of a terrorist group. Nigeria has been classified as the second most dangerous country to live in the world, due to the heinous activities of the Nigerian Government and its armed forces including the army that has been on different occasions linked to Boko Haram. In line with this, many human rights organizations have confirmed it with evidences. Hence the likes of Amnesty International has published a classified information with 33 pages document titled “Stars on their shoulders, Blood on their hands, War crimes committed by the Nigerian military". Amnesty International documented 27 incidents of extrajudicial executions committed by the military in 2013 and 2014. At least 1,200 people and certainly many more were killed in these incidents. 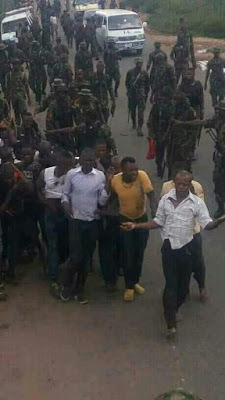 In 14 of these cases, Nigerian military forces, sometimes in collaboration with Civilian JTF members, executed a large number of people, at times dozens or even hundreds in one day. The precise number of extrajudicial executions is impossible to verify due to the lack of records, cover-up efforts by the military, and the difficulty of reaching witnesses in the areas where the crimes were committed. Cases presented in this report provides documentation of extrajudicial executions in Adamawa, Borno and Yobe States of Nigeria. Amnesty International published a detailed report documenting the killings of at least 622 people who had escaped from Giwa barracks. This report presents additional information about the extrajudicial execution of at least 18 other men on that day, including the analysis of videos showing some of the executions. On the 15th of August 2012: Amnesty International sent a nine-page briefing containing the preliminary findings of the report Nigeria: trapped in the cycle of violence to government officials, including the National Security Adviser, the Minister of Justice, the Minister of Foreign Affairs and the Chief of Defence Staff. The findings included cases of extrajudicial executions, enforced disappearances and arbitrary arrests. The letter urged the government to investigate these cases. 5 August 2014: Amnesty International issued a press release, Nigeria: Gruesome footage implicates military in war crimes, and a Q and A, Nigeria’s military implicated in war crimes, describing video footage, images and testimonies which provide compelling evidence of war crimes by the Nigerian military and Boko Haram. 18 September 2014: Amnesty International issued a report titled ‘Welcome to Hellfire’ Torture and other ill-treatment in Nigeria regarding torture by the Nigerian police and military. The report documented cases of torture in military detention facilities in the context of the conflict with Boko Haram. All these and many more are recorded crimes against humanity meted on innocent civilians of the Nigerian state by the men of Nigerian military. Obviously, it's laughable when confirmed terrorists in uniform known as Nigerian Army are tagging peaceful and unarmed civilians like IPOB terrorist group. It's also on record that on November 24th Amnesty International released a report indicting Nigerian military of killing innocent Biafrans. You can read the report via this link; www.amnesty.org/en/latest/ news/2016/11/peaceful-pro- biafra-activists-killed-in- chilling-crackdown/. It's worth knowing that all these reports have implicated and indicted the activities and actions of Nigerian military. Google out the above outlined reports and you will be shocked to understand that Nigerian military are worse than ISIS and Boko Haram combine together.